Q: We have noted that the Foreign Ministry today announced that German President Frank-Walter Steinmeier will visit China. Could you give us more information on this visit? How does China comment on the current China-Germany relations? What is China's expectation for this visit? A: At the invitation of President Xi Jinping, President Frank-Walter Steinmeier of the Federal Republic of Germany will pay a state visit to China from December 5 to 10. This is Mr. Steinmeier's first state visit to China after he assumed the presidency. During the visit, President Xi Jinping and Premier Li Keqiang will hold talks and meet with him on separate occasions, during which the two sides will have an in-depth exchange of views on China-Germany relations, China-Europe relations and major international and regional issues of mutual interest. Besides Beijing, President Steinmeier will also travel to Guangdong and Sichuan. Since this year, China-Germany relations have been developing at a high standard with a sound momentum. The Chinese Premier and German Prime Minister visited each other within this year and the fifth China-Germany intergovernmental consultation was held successfully. Vice Premier Liu He has just paid a visit to Germany and attended the 8th "Hamburg Summit: China meets Europe". The upcoming visit of President Steinmeier to China once again testifies to the closeness of bilateral ties, especially in terms of the high-level exchanges. Our practical cooperation in economy, trade and investment has been making new outcomes and the bilateral trade volume is expected to hit historic high again this year. Meanwhile, China and Germany, as comprehensive strategic partners, have conducted good coordination and cooperation on jointly upholding multilateralism and free trade system, building an open world economy and promoting the peace, stability and development of the world. President Steinmeier visited China many times in the capacity of German Foreign Minister and made positive contributions to the growth of China-Germany ties. 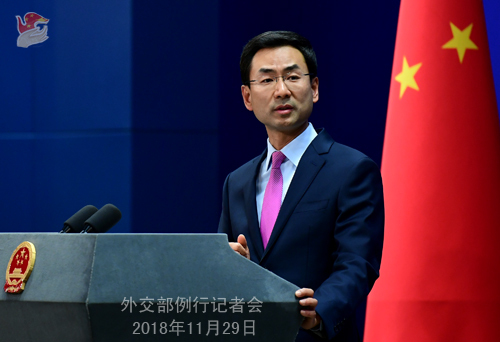 China hopes that this visit can further enhance the political and strategic mutual trust between our two countries, marking a perfect ending to our high-level exchanges in this year and inject new impetus into the all-round cooperation between our two sides at the bilateral, China-Europe and global levels. Q: China's General Administration of Customs today issued a notice, allowing the imports of rice from Niigata, Japan. After the Fukushima accident, China has been restricting importing products from relevant regions. What are China's considerations behind making such kind of decision? Will China lift restrictions on importing food from other places of Japan? A: Just like you said, this morning China's General Administration of Customs issued a notice and I believe that you have seen it. In principle, China always attaches importance to the safety of imported food. We will continue to follow the scientific principle to deal with the issue of food imports from Japan. The competent authorities of the two countries will continue to maintain communication. Q: The US Navy has sent two warships through the Taiwan Strait on Wednesday. What is China's response? A: The Chinese side has been closely monitoring from start to end the passage by the US warships through the Taiwan Strait. We have expressed our concern to the US side. The Taiwan issue concerns the sovereignty and territorial integrity of China. It is the most important and sensitive issue in the China-US relations. We urge the US to observe the one-China principle and the stipulations of the three China-US joint communiqués and prudently and properly handle Taiwan-related issues so as to avoid undermining China-US relations and the peace and stability across the Taiwan Strait. Q: Yesterday the US Trade Representative threatened tariffs on Chinese automobiles and said that China's aggressive and state-directed industrial policies were harming US workers and manufacturers, and China taxes US cars more than double the rate it charges other countries. What is your comment? As far as I know, since July 1, China has cut its vehicle import tariffs from 25% to 15%. But due to the trade disputes provoked by the US, starting from July 6, China imposed additional 25% on top of the 15% rate for most of the automobiles imported from the US on China's list for tariff increases, thus pushing the total rate to 40%. That is to say, were it not for the trade disputes and the tariff impositions initiated by the US, the tariff rate for automobiles imported from the US would have been 15%. In addition, due to differences in resource endowment and industrial competitiveness, it's very difficult for two economies to realize absolute reciprocity and openness and tariffs also vary from industry to industry. I believe you all understand that. A case in point is China's tariff on unshelled peanuts, which stands at 15%. But according to WTO statistics, the US tariff rate for unshelled peanuts is 163.8%, around 11 times of that of China. So when it comes to a specific industry, there is no such a thing as absolute reciprocity. The most pressing issue is that the two sides need to resolve trade disputes and existing issues through dialogue and negotiation. Issuing constant threats through media and wielding the big stick of sanctions will never help. 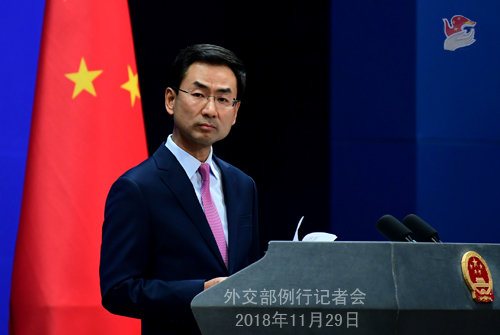 Q: The US Embassy voiced concern over the disappearance of the US-based photographer Lu Guang and in a comment condemned China's "worsening human rights abuse". What is your comment on that? A: Yesterday I already gave my reply when a journalist raised this question. I am not aware of the specific case. As to the comment on China's human rights situation by the US side, I believe the Chinese people, rather than the US government, have the best say about China's human rights. Besides, we also hope the US side will follow the principle of not interfering in others' internal affairs just as they once said. Just as they don't want others to meddle in their internal affairs, we don't want them to meddle in ours, too. Q: I noted the TV footage showing that at the welcoming banquet for President Xi Jinping in Spain, all Chinese officials were dressed in Zhongshan suits (Note: Chinese-style formal dress), including State Councilor Wang Yi. Is this the first time for such a case or not? A: I believe it is not the first time that Chinese leaders wore Chinese-style formal dress on such formal occasions as this grand welcoming banquet held by the Spanish King. 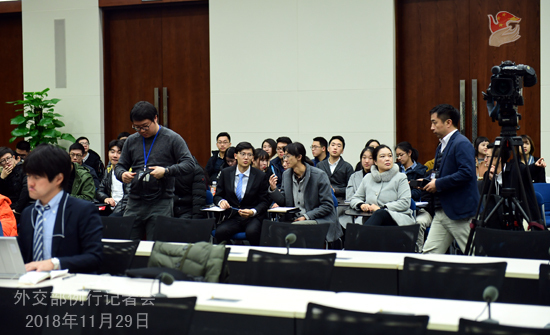 Follow-up: I have seen Chinese officials attend events in Zhongshan suits before, but I suppose it's the first time that all of them were dressed in such suits? A: Like I just said, that was a very formal occasion, and wearing Chinese formal dress conforms to the dress code of such an occasion. Besides, thank you for your interest in our diplomatic events.